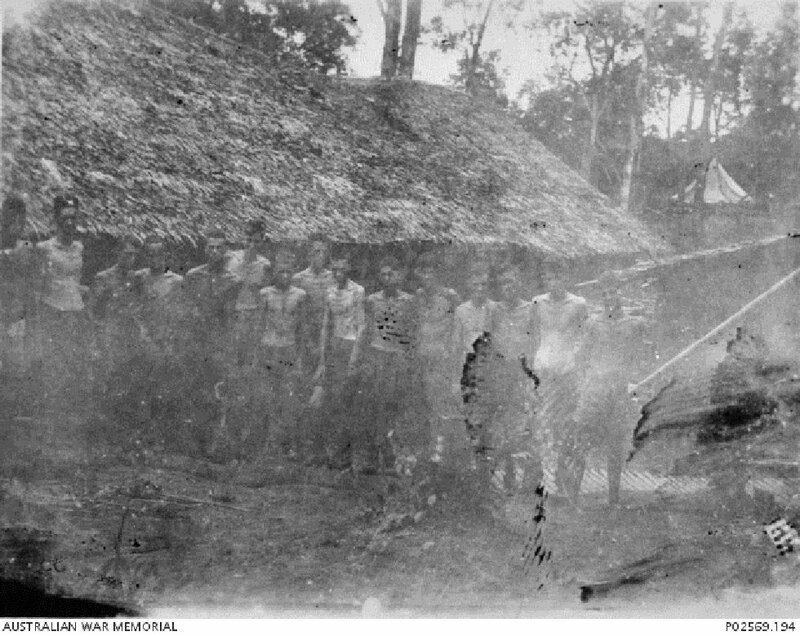 Malnourished and sick Australian POWs, outside an attap hut that served as a hospital for Allied POWs working on the Burma-Siam railway, 1943. Image courtesy of George Aspinall, Australian War Memorial. In April 1943, orders were issued by Japanese HQ Allied POWs in Malaya that a POW force, to be composed of 3600 Australians and 3400 British, was to be sent north from Changi. Many of those selected were already unfit, having suffering or was suffering from diseases such asdysentery and beri-beri. After a train journey to Bampong, Siam POWs were made to march 300km to their destination through difficult terrain. 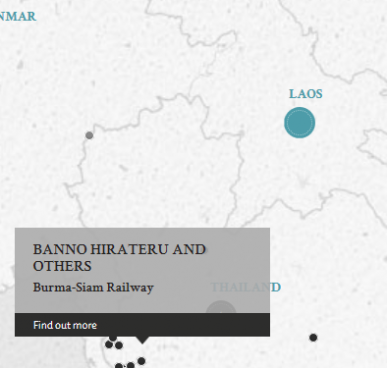 The POWs were in fact brough to Siam to construct the Burma-Thailand Railway. Working conditions were bad with the POWs having to work for long hours, under unsanitary conditions and constant beatings by the Japanese. As a result, more than 3000 of the original 7000 men died and 1000 men had to be left behind in Burma or Siam either as sick and incapable of surviving the journey or as medical and adminstrative personnel in charge of them. Those who returned were not sparred from disease either. It was said that upon return, there were only 125 men fit for light duty only. The accused, who were all staff of the various camps, were said to have played a role in the suffering and death of the said POWs. Trial records consist of several hundred pages of evidence that include, inter alia, servicemens' diaries, staff reports by POW officers and transcripts of the proceedings of the Australian War Crimes Commission. This case is a compelling read for anyone interested in the working and living conditions of the POWs involved in the construction of the Burma-Thailand Railway. Banno, Hirateru. Lieutenant Colonel. From Japanese military. From Japan. Guilty. 3 years' imprisonment. Sentence confirmed with no change. Tanio, Susumu. Captain (Medical). From Japanese military. From Japan. Guilty. 5 years' imprisonment. Sentence confirmed with no change. Maruyama, Hajime. Captain. From Japanese military. From Japan. Guilty. Death by hanging. Sentence confirmed with commutation to 15 years' imprisonment. Fukuda, Tsuneo. Captain. From Japanese military. From Japan. Guilty. Death by hanging. Sentence confirmed with commutation to life imprisonment. Toyoyama, Kisei. From Japanese military (Korean Guard). From Korea. Guilty. Death by hanging. Sentence confirmed with commutation to life imprisonment. Abe, Hiroshi. Lieutenant. From Japanese military. From Japan. Guilty. Death by hanging. Sentence confirmed with commutation to life imprisonment. Ishimoto, Eishin (Yang-Hye Kun). From Japanese military (Korean Guard). From Korea. Guilty. 18 months' imprisonment. Sentence confirmed with no change. Blacklock, E.N. Lieutenant Colonel. From British military. Court President. Hodgens, S.F. (Distinguished Service Order.) Major. From Australian military. Dixon, O.F. Captain. From Australian military. Legal Practitioner of the High Court of Australia and Supreme Court of Tasmania. Lead Counsel. Eber, J. St. J. Civilian. Barrister at Law, Inner Temple. Co-Counsel. Kawazoe, Toshioki. Civilian. District Judge, Oita. Lead Counsel. Hashimoto, Kazumasa. Civilian. Judge, Sendai District Court. Co-Counsel. Wait, R.T. Captain. From British military. Law student.